Work continues on the Great American Aran Afghan, and I’m on my third square. I’m finding that this is (so far) tremendously interesting. I’ve finally learned to read cable charts without constantly referring to the stitch definition, and the small size of each piece (relative to, say, an entire afghan) makes it very easy to carry around. It’s delightful to watch the pattern appear quickly. Neither of the two squares are finished as pictured. 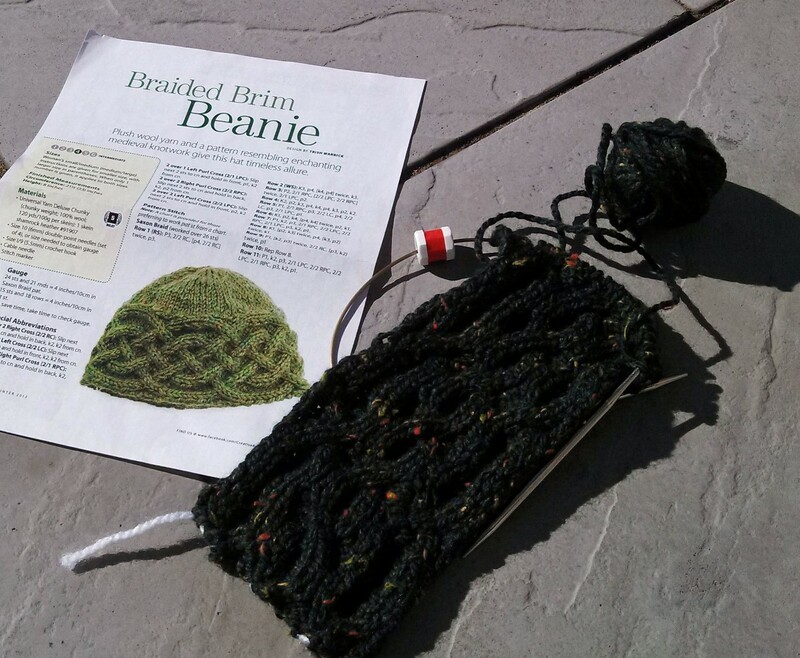 The one on the left was knit “around” and the center is picked up and knit with decreases – something like a cap. The problem is, I didn’t have the correct size DPNs for the center section. I tried to use circular needles, but that didn’t work. 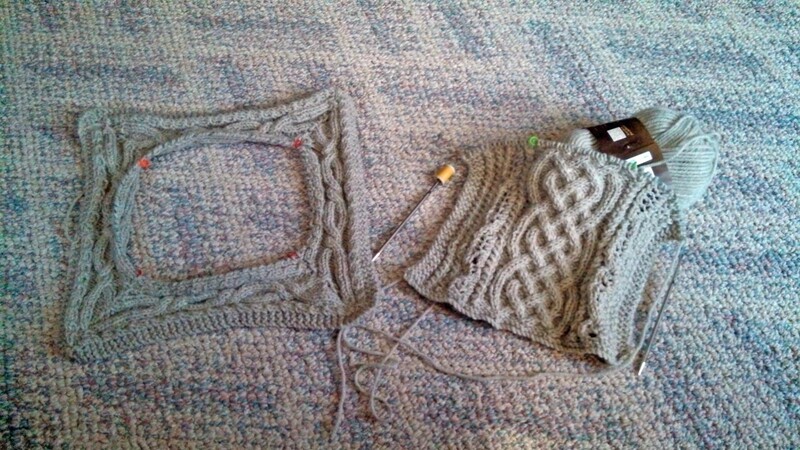 So, I set it aside, (ordered size 6 HiyaHiya DPNs) and started the next square (on the right). A dear and long-time friend is getting married in February. My customary wedding gift is a hand-knit afghan, and for this good friend, I wanted to “kick it up a notch” and knit a very special afghan. 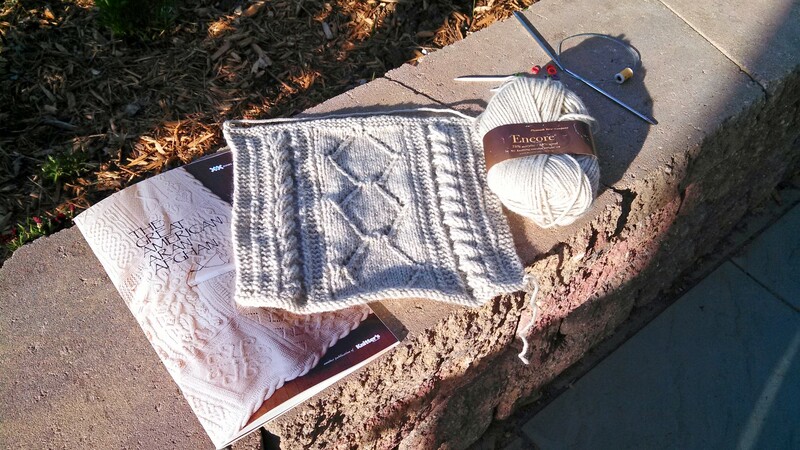 I chose The Great American Aran Afghan, which is part of the Great American Afghan series by XRX Publishing. There are several in this series, and it seems to be a contest along a theme, and the winning entries are included in the published book. Yarn is as recommended in the book: Encore (75% acrylic – 25% wool) from Plymouth Yarn Company. The model is knit in natural or white, but I chose Oatmeal as a more neutral color. The afghan is a series of “sampler-like” squares which are knit together and then a border knit around the perimeter. The squares are extremely challenging! I’m glad it’s knit a square at a time; I don’t think I would be able to cope if I had to knit something as challenging as this with a large “afghan-in-progress” on my lap. Below is my first completed square – I think it’s likely the easiest in the book. My friend’s wedding is in February. For a 24-square afghan, that’s about 4 squares a month, with a month left for assembling and binding. Wish me luck!